[PKM] decided to breathe new life into a Psion 5mx handheld. He slapped linux on it, added a wikipedia dump to a CD card, and voila: pocket wikipedia. It’s the closest thing to an actual hitchhikers Guide to the Galaxy I’ve ever seen. So long and thanks for all the fish! haha that’s a kind of cute project! The Amazon Kindle allow you to freely and unlimitedly browse wikipedia. Unfortunately it works only in US (except in Alaska and mybe another state, can’t remember). I could use one of those… I like the handheld unit. Looks like a fun little project for one of my old PDAs. The letters for Don’t Panic are not friendly enough. You’d have to take that up with the creators of the TV show. I did this about 4 years ago with a Zaurus C860 running Xfce on pdaXrom. I doctored up the cels from the Babelfish animation for the background. Where the orginal text was, I had torsmo display Artist and Title info from xmms so it read something like: “The Zaurus C860, while comparable in computational power to the Googleplex Starthinker, was mainly used to play bad music, such as %T by %A.” I customized some icons from the Monochrome KDE theme for the menubar/launcher, and it ended up looking pretty good. 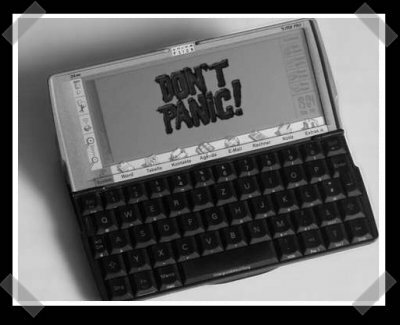 Xfce made it easy to implement a “DON’T PANIC” splashcreen. Thanks for posting such a terrific weblog. Your website was not only useful but also bvery imaginative too. We come across a limited number of bloggers who are capable of write technical articles that creatively. A lot of people keep looking for information with regard to a subject like this. I Myself have gone through several websites to find information with regard to this.Looking for much more information from you ! !